If you are installing WordPress on your own web server, follow the one of below instructions to create your WordPress database and user account. 3. Click Add New Database, change database name if you want, create database user by providing credentials and click OK. You're done! 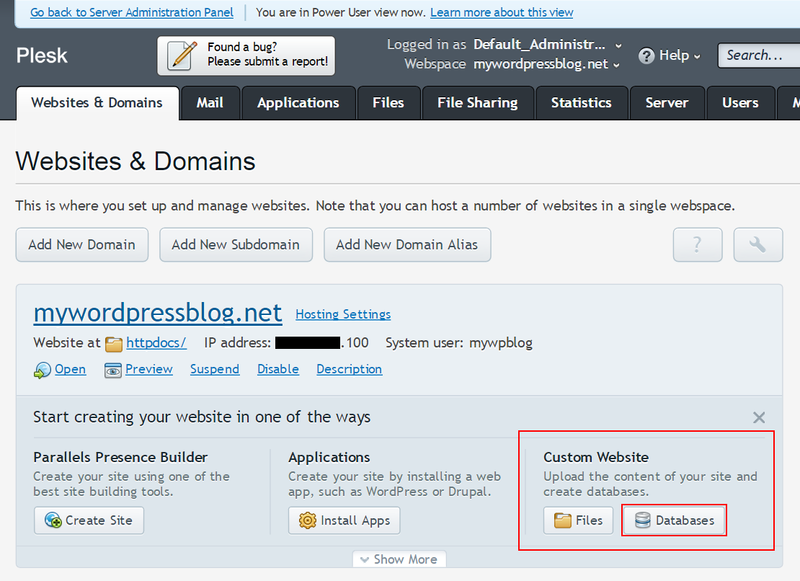 If your hosting provider supplies the cPanel hosting control panel, you may follow these simple instructions to create your WordPress username and database. A more complete set of instructions for using cPanel to create the database and user can be found in Using cPanel. Click MySQL Database Wizard icon under the Databases section. In Step 1. Create a Database enter the database name and click Next Step. In Step 2. Create Database Users enter the database user name and the password. Make sure to use a strong password. Click Create User. In Step 3. Add User to Database click the All Privileges checkbox and click Next Step. Lunarpages has developed their own version of cPanel. Click on the button on the left panel labeled 'Go to LPCP'. Add the user name and database name but leave the host name as the default IP number. Note the IP address of the database on the right which is different from the default IP number of the host indicated in the above step. When modifying the wp-config.php file, use the DB IP number, not 'LOCALHOST'. When modifying the wp-config.php file, be sure to use the full name of the database and user name, typically 'accountname_nameyoucreated'. Refer to http://wiki.lunarpages.com/Create_and_Delete_MySQL_Users_in_LPCP for more info. If your web server has phpMyAdmin installed, you may follow these instructions to create your WordPress username and database. If you work on your own computer, on most Linux distributions you can install PhpMyAdmin automatically. Note: These instructions are written for phpMyAdmin 4.4; the phpMyAdmin user interface can vary slightly between versions. Choose a name for your WordPress database: 'wordpress' or 'blog' are good, but most hosting services (especially shared hosting) will require a name beginning with your username and an underscore, so, even if you work on your own computer, we advise that you check your hosting service requirements so that you can follow them on your own server and be able to transfer your database without modification. Enter the chosen database name in the Create database field and choose the best collation for your language and encoding. In most cases it's better to choose in the "utf8_" series and, if you don't find your language, to choose "utf8mb4_general_ci" (Reference: ). Choose a secure password (ideally containing a combination of upper- and lower-case letters, numbers, and symbols), and enter it in the Password field. (Be sure Use text field: is selected from the dropdown.) Re-enter the password in the Re-typefield. Write down the username and password you chose. Leave all options under Global privileges at their defaults. # Return to the Users screen and click the Edit privileges icon on the user you've just created for WordPress. # In the Database-specific privileges section, select the database you've just created for WordPress under the Add privileges to the following database dropdown, and click Go. # The page will refresh with privileges for that database. Click Check All to select all privileges, and click Go. mysql> GRANT ALL PRIVILEGES ON databasename. * TO "wordpressusername"@"hostname"
that root is also the adminusername. It is a safer practice to choose a so-called "mortal" account as your mysql admin, so that you are not entering the command "mysql" as the root user on your system. (Any time you can avoid doing work as root you decrease your chance of being exploited.) The name you use depends on the name you assigned as the database administrator using mysqladmin. wordpress or blog are good values for databasename. wordpress is a good value for wordpressusername but you should realize that, since it is used here, the entire world will know it, too. hostname will usually be localhost. If you don't know what this value should be, check with your system administrator if you are not the admin for your WordPress host. If you are the system admin, consider using a non-root account to administer your database. password should be a difficult-to-guess password, ideally containing a combination of upper- and lower-case letters, numbers, and symbols. One good way of avoiding the use of a word found in a dictionary is to use the first letter of each word in a phrase that you find easy to remember. If you need to write these values somewhere, avoid writing them in the system that contains the things protected by them. You need to remember the value used for databasename, wordpressusername, hostname, and password. Of course, since they are already in (or will be shortly) your wp-config.php file, there is no need to put them somewhere else, too. a. If you're a regular User of a single-site webhosting account, you can log in normally. Then click MySQL Management. (If this is not readily visible, perhaps your host needs to modify your "package" to activate MySQL.) Then follow part "c" below. c. In MySQL Management, click on the small words: Create new database. Here you are asked to submit two suffixes for the database and its username. For maximum security, use two different sets of 4-6 random characters. Then the password field has a Random button that generates an 8-character password. You may also add more characters to the password for maximum security. Click Create. The next screen will summarize the database, username, password and hostname. Be sure to copy and paste these into a text file for future reference.